Late in 2014 there appeared a new full-color very anthropomorphic comic called Squarriors, written by Ash Maczko and illustrated by Ashley Witter. “In a post-human world, two tribes of animals find themselves on the brink of war. 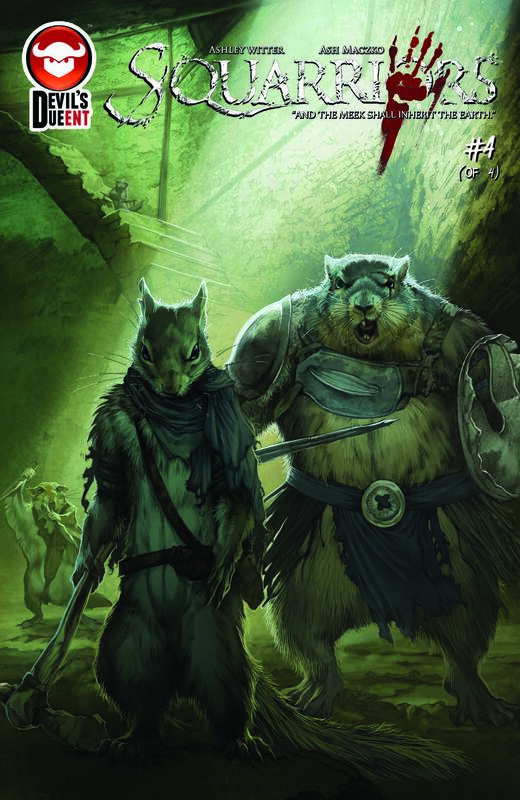 Will they survive and find peace, or follow humanity into extinction?” For reasons not clear, humanity has vanished and been replaced by various forest animals, lead by the squirrels… and engaged in deadly, very bloody battles over territory. Now that the first 4-issue story arch has been completed, later this month publisher Devil’s Due is releasing them all together as a single trade paperback. Take a look at their web site — but be warned: When we say bloody, we mean it.